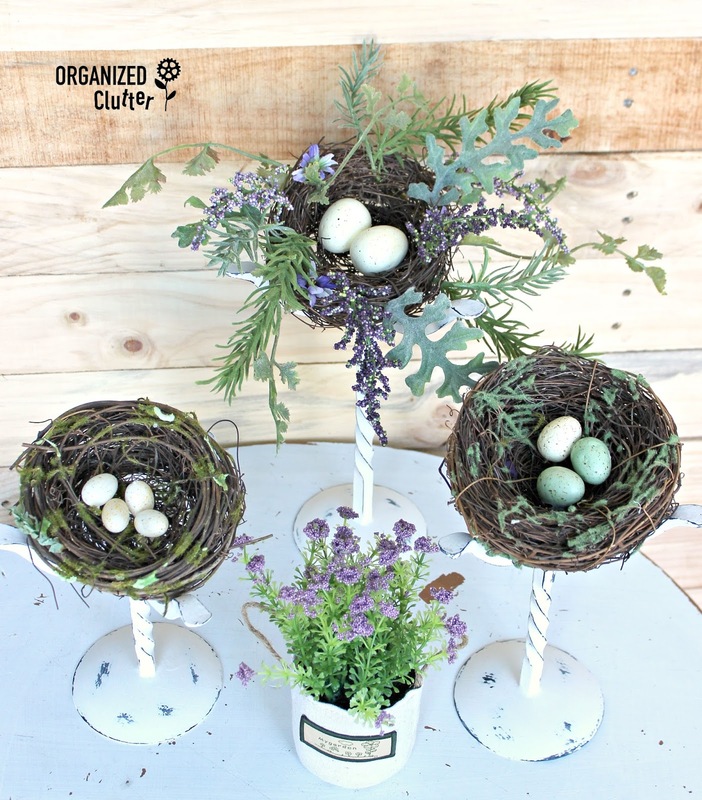 I am dreaming of spring, so I decided to makeover these three thrift shop, black metal, candle holders with spring in mind. After cleaning them up, I painted them with two coats of Dutch Boy Chalky Finish Paint in Antiquated Lace. Next I wet distressed the chalk paint with a damp rag, mostly on the edges, and sprayed on an acrylic sealer from Krylon. No, they are not upside down. The candle holders are now bird's nest holders. The nests fit perfectly and are at three different heights for more interest. How about that top bird's nest? It's a new purchase from the company MeraVic. It's a little spendy but I can't find everything at the thrift shop! Love how you used the bird nest on the candle holders. 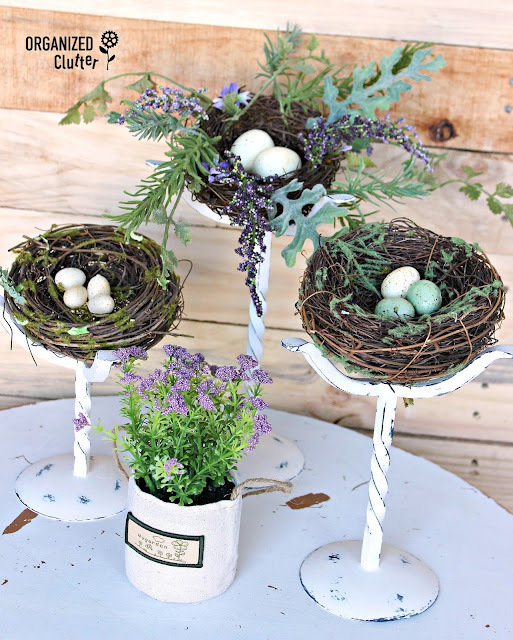 I love decorating with birds and bird nests and need to get busy making my mantel up for Spring. I am thinking bird nests. SOOOOOO adorable! I never saw that one coming. Your ideas are really so genius! very cute! i collect no-longer-used bird nests and could use them! Really cute. You could put them right side up. I would think the nests would sit well in the little bowl tops. But I like the way you think. I wouldn't have been that clever. CUTE, CUTE, CUTE project!! Thanks for sharing. I love those! Thought it was upside down! Amazing! Love all of your great ideas! 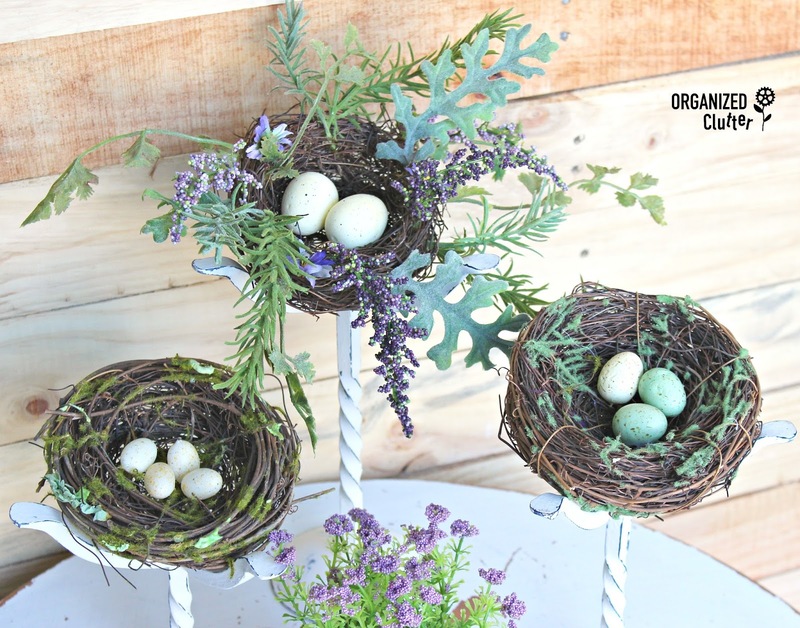 Cute way to display the nests. Can't wait to see your next remake. What an adorable idea. Thanks for sharing. Oh, you turned them upside down!! Great idea, they look so cute!! 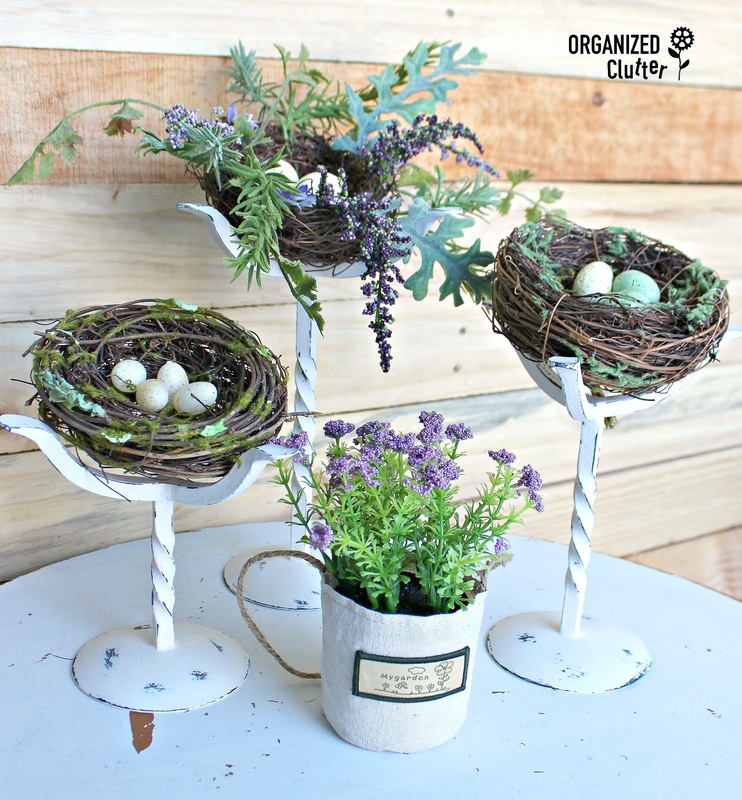 Oh those are precious with the bird's nests displayed in them! The plant in the middle completes the look. HOW do you come up with these ideas? Thanks I have these and don't use them anymore. Because of space limitations, I put them in the donate box. I guess I'll get them out and will keep them to do this idea in the Spring. I have those candlesticks sitting around in my garage and was going to throw them away. Glad I still have them and will do this.